Like to become a Volunteer? My husband and I love music, so we take advantage of the many free concerts churches and other organizations offer. In the past I’ve sat through these concerts feeling left out because my profound hearing loss prevents me from hearing the fine details of the musical scale. This year things have changed. I discovered that the buildings where I attend concerts have installed hearing loops, which allow me to stream music through my hearing aids. Once installed hearing loops, also known as audio induction loops, provide a magnetic field which can be accessed through a hearing aid’s t-coil function or loop function. On my Oticon OPNs I simply go to my iPhone app and select the loop feature. Instantly, music is streamed into my ears. Scientists began experimenting with magnetic loops in the 1700s. In 1937, a UK scientist developed a patent for a telephone coil. The technology really took off when hearing aids became equipped with a telephone coil, a very popular feature on aids, which helped those of us with hearing loss to hear telephone conversation. I remember using the t-coil on some of my older hearing aids. It was a bit cumbersome, but it did help me hear the person on the other end of the line. 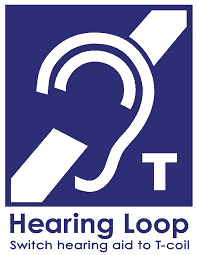 In the late 1980s, several European companies came out with hearing loop systems that could be used in large rooms and conference halls to provide a signal that could be picked up by hearing aids equipped with t-coils. So, when attending a conference, one suffering from hearing loss could hear a speaker or lecturer because the sound was streamed to them. Hearing loop technology was always much more prevalent in Europe, but in the last few years, American audiologists and private companies see the advantage to this technology. Hearing Loss Association of America and hearingloop.org have much information about hearing loops on their websites. These organizations are strong advocates of a Let’s Loop America program, encouraging businesses, churches, schools, bus stations, and airports to install loop systems. Here in Southwest Florida, organizations and businesses are beginning to loop their venues. I’ve discovered that the church we attend and many of the free concerts we enjoy are in buildings equipped with loop technology. It is a pleasure for me to sit back, switch my hearing aids to the loop setting and have access ti my own personal sound system. How do you know if a public building is looped? Many use a universal symbol that looks like this. If you don’t see the symbol, ask or simply try switching your aids to the t-coil setting and within a minute or less you will know if you are picking up sound. Because I suffer from profound hearing loss, it isn’t always easy for me to be out and about, enjoying all our lovely area has to offer. But I applaud the organizations who have spent the money and resources to help out people with hearing loss to enjoy a concert, lecture or church service, thus making our meanderings through a hearing world accessible and a little more pleasant.